Welcome to the next installment of the How Molecular Ecologists Work series! For this entry, we have Dr. Aaron Shafer, who is currently transitioning from a postdoc position at Uppsala University to an assistant professor position at Trent University. Aaron uses molecular tools to understand the history and future of wild mammal populations (mountain goats, deer, even walrus!). His approach has produced multiple projects with both conservation applications and insights into the evolution of wildlife populations. Population genomics of mammals. I am interested in characterizing the demographic history of wild populations and identifying the genetic basis of various behavioural and phenotypic traits. My work has a conservation angle, so understanding demography in terms of the degree of isolation or environmental drivers are key elements. In establishing a lab I have been thinking a lot about what the future holds for high-throughput sequencing; in particular what steps/equipment that are predominantly outsourced at the moment will become feasible for a standard labs in the near future. Here both thefinances, expected use, and required expertise are all things I’m weighing when building up in-house genomic resources. Similarly, in planning projects I have been very conscious of computational and bioinformatic requirements as this is becoming a limiting factor for genomic studies. I’ve been in Sweden for the past four years and we’ve been very fortunate in this regard (see https://gigascience.biomedcentral.com/articles/10.1186/2047-217X-2-9). 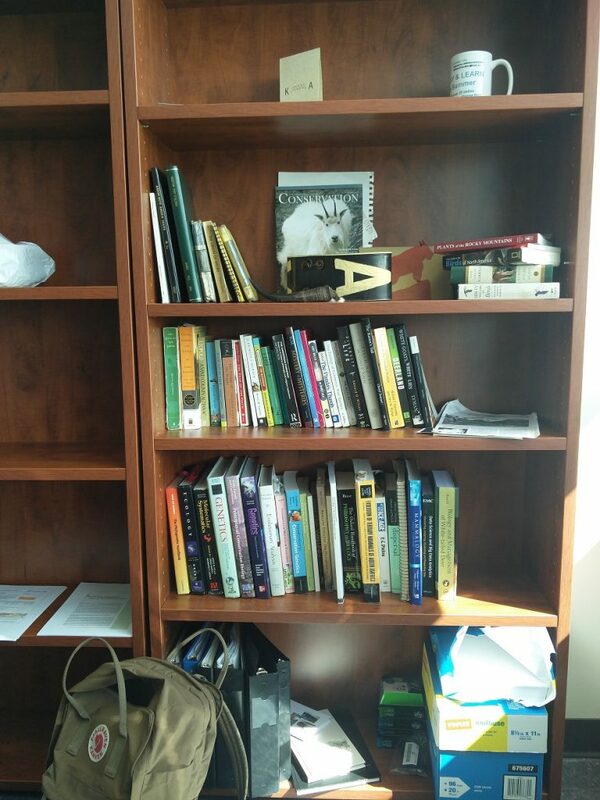 As a new faculty member I’ve yet to independently supervise a graduate student (but here’a plug for my new lab – http://www.aaronshafer.ca/join-the-lab/). After experiencing both the European and North American systems, I’m keen to provide projects that give graduate students sufficient autonomy when it comes to generating their own ideas and pursuing them. We’ll see how well that goes! All of my data is stored on a cluster and most of the analyses are conducted on the cluster. Some raw data I’ll load on my desktop for fun and I’ll analyzed processed data on both my laptop and desktop. JamBox as I love having portable music and podcasts. A bit of a disclaimer as I’m transitioning from postdoc to faculty this is a bit of hybrid. Do NOT get stuck on a sentence. 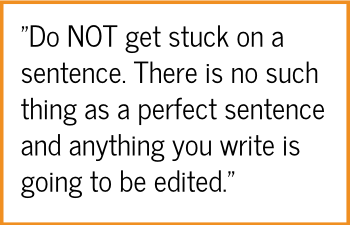 There is no such thing as a perfect sentence and anything you write is going to be edited. Five minutes here and there trying to make the sentence sound just write adds up. I will leave sentences unfinished if I’m not feeling it and just keep on writing. Make sure you highlight those! Not a shortcut but I try to take full advantage of moments of inspiration. Work can become monotonous so when you have those moments where it’s like I want to the discussion to tackle this issue OR I wonder if I can calculate it this way USE THEM. To-do lists and digital calendar, but I am shifting to rely fully on my Moleskine. 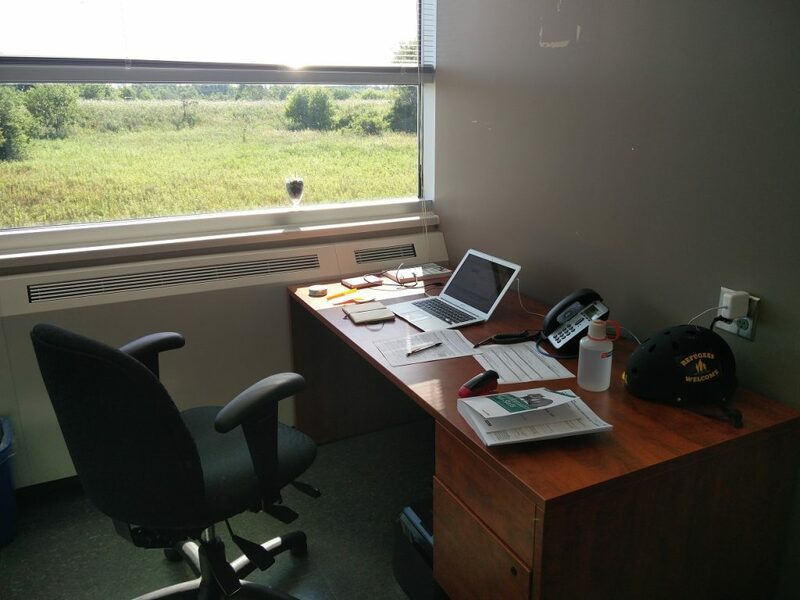 Aaron currently in the lead for the “Best Office View” category! German hip-hop when I want to be productive – I don’t understand the language so it doesn’t distract me and there is something about colliding German consonants and beats that just works. If I am doing anything mindless I’ll always turn on a podcast (I have about a dozen I subscribe to – for the ME crowd you should listen to Radio Lab if you don’t already). Horrible. I love coffee (and Swedish Fika) so I try to get moving early. Fill in the blank: I’d like to see _____ answer these questions. Don’t be afraid to phone someone. In the current internet climate we all get boatloads of emails, so separate yourself from the bunch! Thanks Aaron! Next up: Dr. David Toews, Banting Postdoctoral Fellow at Cornell University.